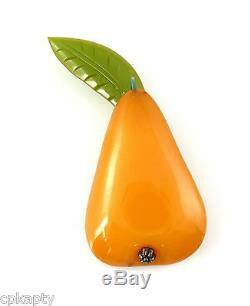 For sale here is a BIG vintage 1930s 40s handmade carved Bakelite fruit Pear design brooch pin. Guaranteed to be genuine vintage 1930s 40s Bakelite, not a reproduction! There is a small pinhole near the leaf at top of the pin. I'm not sure if it used to have another leaf, or if someone was over-zealous in testing this pin. In any case, it's not at all noticeable when worn. Please read my terms and'fine print' below. I've been in the vintage/collectible business for over 35 years. I'm on the list of advisers for both the second and third editions of Warman's Jewelry by the late great Christie Romero. I was a founding member for the online discussion group Silver Forum and the Modern Silver website with Marbeth Schon. I was a contributing author for the traveling exhibition and accompanying book, "William Spratling, and the Mexican Silver Renaissance" edited by Penny Morrill. I'm a gemologist, and I have jewelry design and jewelry-making experience. The item "BIG Vintage 1930s 40s Handmade Carved Bakelite Fruit PEAR Design Brooch PIN" is in sale since Tuesday, December 5, 2017. This item is in the category "Jewelry & Watches\Vintage & Antique Jewelry\Costume\Bakelite, Vintage Plastics\Pins, Brooches". The seller is "cpkapty" and is located in Arizona. This item can be shipped worldwide.